New & improved design holds twice the capacity of spilled liquids! Lloyd’s RubberTite All Weather Mats now have large “wells” to hold twice the capacity of spilled coffee, melted snow, and other liquid messes. 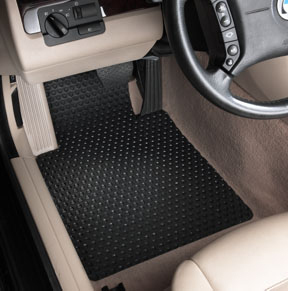 These Exact Fitting floor mats are custom made for your car, truck, SUV or van. Whatever vehicle you drive, Lloyd has a pattern that fits it to a T.
It’s Sunday, and you’ve spent a good deal of the morning detailing your car, inside and out. You’re finally ready to cruise the highway, when you notice something still doesn‘t look right. You notice that your car mats are too big for your floorboards, and too often they move around, making it difficult to feel complete comfort while driving. Why not invest in custom fitting mats that will enhance your car’s interior and last for years? Lloyd’s Mats, the largest all model manufacturer of custom fit mats, will help you achieve just that. The RubberTite Exact Fitting All Weather Mats™ allow you to choose mats that are proportioned to your floorboards, and once in place, fit like a glove. Larger wells provide a greater capacity for liquids. Spills will fill up the special molded cups rather than running all over your vehicle’s floor. Liquids will stay put until you get to a place where you can safely soak up the spill. Nonskid backing. The underside of each mat is covered with small bumps that literally grab the carpet and hold on no matter how much you move your feet. They don’t pierce the carpet or cause damage. The nonskid backing just keeps the mats firmly in place so they don’t bunch or slide while you’re driving. Textured non-slip surface. 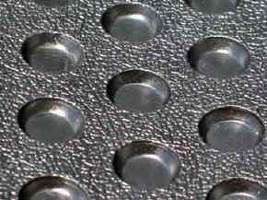 In addition to cups, the top sides of Lloyd RubberTite mats are textured between the wells to keep your feet from slipping and sliding. Twice as thick as flat vinyl mats. Thicker is best when it comes to car floor mats. The floor of a car, particularly in front of the driver’s seat, is subject to wear caused by the driver’s heel. In older cars, you’ve probably seen where the carpet has completely worn away in that spot. Thick Lloyd mats will better protect the carpet from the constant wear of your lead foot! Clear mats are available. If you’re concerned about matching the color of your interior, the safe choice is clear. Your vehicle’s carpet will show through these mats and, after a couple of weeks, they won’t be noticeable at all. 5 year manufacturer warranty. 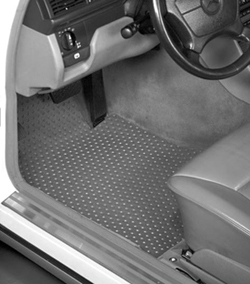 Lloyd RubberTite Custom Floor Mats are constructed of heavy duty rubber to last for years. They’ve got the warranty to prove it! Style and Comfort. These mats look like they belong in you car, unlike factory or store bought mats that tend to look ill-fitting. I like to compare it to a brand new suit. You can’t buy a suit off the racks; it needs to be custom fitted to you, through measurements and tailoring. If the shoulders dimensions are too large, it won’t fit. If the length of your pants is too long, you can’t walk correctly. The same goes for your car mats. The perfect fit is key to quality performance and an overall attractive, interior look. They are contemporary in design, from edge to edge. You work hard detailing your car’s interior week after week. Why not treat yourself to Lloyd RubberTite All Weather Car Mats™ . Your car will always look pristine with these exceptional car mats in place. Floor mats are custom made. Please allow 7-14 business days for delivery.